Farm in production since 1849! 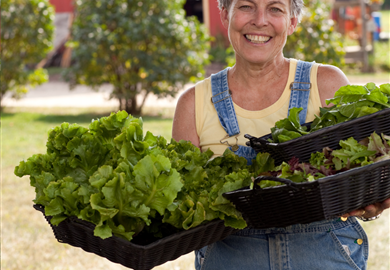 Kinnikinnick Farm is a small, family owned, organic farm located 85 miles northwest of Chicago. 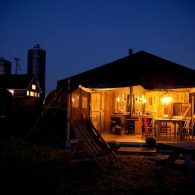 The farm is tucked away in the gently rolling hills of northern Illinois, just a few miles south of the Wisconsin state line. It is named after the stream that runs through it. The farm has been in continuous production since 1849 and the original log cabin still stands — the central room of the farm’s nineteenth century farm house. As a working farm, life follows the rhythm of the seasons so there is always something to do. 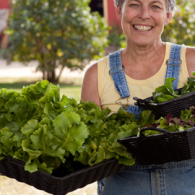 Guest participation in farm work can vary from just watching to rolling up sleeves and helping with farm chores, harvesting crops, tending the farm’s own garden, feeding animals, or simply gathering eggs. 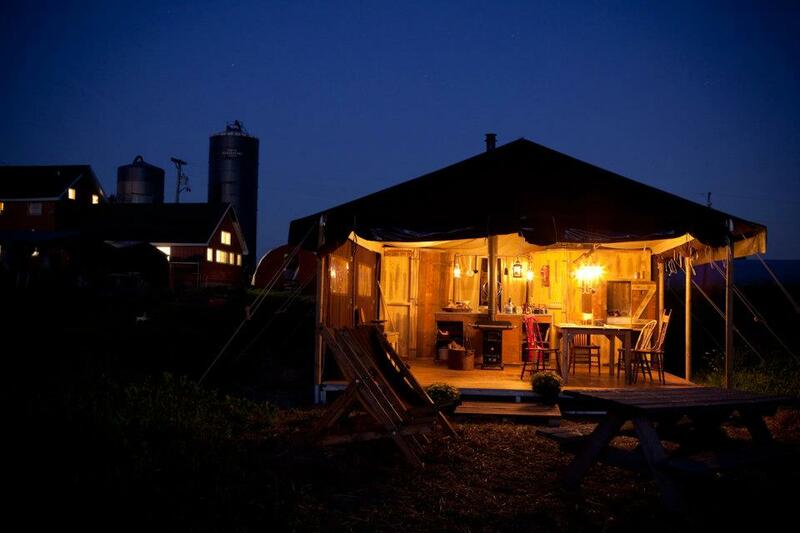 Part of the Feather Down Farms franchise, guests stay in wood-floored tents located along the wooded “Oak Alley” up a slight rise to the east of the farmhouse and farm buildings, not too far away from the chickens. Every Feather Down farm tent is incredibly spacious and comfortable, with a traditional interior reflecting the honest rural life of years gone by. With more than twice the living area (480 sq. ft.) of a normal family tent, each tent is fully outfitted to accommodate up to six people (maximum 5 adults) and has a flush toilet, cold running water in the kitchen, and a wood-burning stove that serves for both heating and cooking. With no electricity in the tent, candles and oil lamps are used for lighting. All these charming touches combine for an enchanting, authentically rustic experience. From the tent site, there are views to the west and south of the meandering Kinnikinnick Creek and the hills that roll down towards the Rock River.The farm is surrounded by a network of country roads which weave through the hills connecting farms and neighbors to each other and to the larger outside world. Special Instructions: 2 bunk beds, 1 double bed, 1 "cabinet" bed (1 adult or two children). Instructions: Rates do not include meals and other on-farm purchases. Visit https://clients.innroad.com/kinni/property.aspx for current availability and rates. Special Instructions: 2 bunk beds, 1 double bed, 1 "cabinet" bed (1 adult or 2 children).